The MCMC procedure in SAS/STAT 14.1 was enhanced with the ability to access lead and lagged values for random variables that are indexed. Two types of random variables in PROC MCMC are indexed: the response (MODEL statement) is indexed by observations, and the random effect (RANDOM statement) is indexed by the SUBJECT= option variable. This new capability extends the range of models that you can fit by using PROC MCMC. For example, you can now fit certain dynamic linear models that were previously inaccessible. In other cases, model specification in PROC MCMC is greatly simplified. For example, to fit autoregressive time series models before this enhancement, you were required to preprocess the data and manually generate variables that contain the lagged values of the response variable. Also, there was no built-in means to account for the initial states of the lagged variables. With the new enhancement, autoregressive time series models no longer require you to preprocess the data, and you can easily specify starting values or prior distributions for the unobserved initial states. What follows are two examples that demonstrate the use of this enhancement to PROC MCMC. The first example fits a fourth-order autoregressive model (AR(4)). The data in the example are simulated in order to avoid the issue of model identification. 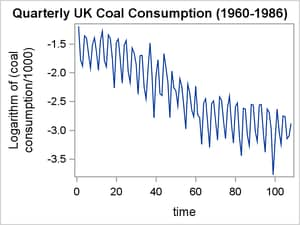 The second example fits a dynamic linear model with time-varying coefficients to UK coal consumption data, inspired by examples from Congdon (2003) and Harvey (1989). The first example demonstrates the use of lagged values in the MODEL statement, and the second example demonstrates the use of lagged values in the RANDOM statement. Both examples also demonstrate how to produce forecasts by using the PREDDIST statement. rv.Li: the ith lag of the variable rv. This looks back to the past. rv.Ni: the ith lead of the variable rv. This looks forward to the future. The construction is allowed for random variables that are associated with an index, either a response variable or a random-effects variable. You concatenate the variable name, a dot, either the letter L (for “lag”) or the letter N (for “next”), and a lag or a lead number. PROC MCMC resolves these variables according to the indices that are associated with the random variable, with respect to the current observation. At each observation, PROC MCMC fills in the symbol mu with the random-effects parameter that belongs to the current cluster t. To fill in the symbol mu.l1, the procedure looks back and finds a lag-1 random-effects parameter, , from the last cluster t–1. As the procedure moves forward in the input data set, these two symbols are constantly updated, as appropriate. When the index is out of range, such as t–1 when t is 1, PROC MCMC fills in the missing state from the ICOND= option in either the MODEL or RANDOM statement. The following example illustrates how PROC MCMC fills in the values of these lag and lead variables as it steps through the data set. PROC MCMC finds relevant symbol values according to this list, as the procedure steps through different subject cluster. The process is illustrated in Table 1. For observations in cluster a, PROC MCMC sets the random-effects variable mu to , looks back two lags and fills in mu.l2 with alpha, looks back one lag and fills in mu.l1 with beta, and looks forward two leads and fills in mu.n2 with . As the procedure moves to observations in cluster b, mu becomes , mu.l2 becomes beta, mu.l1 becomes , and mu.n2 becomes . For observations in the last cluster, cluster e, mu becomes , mu.l2 becomes , mu.l1 becomes , and mu.n2 is filled with kappa. where is a constant, are the unknown autoregressive parameters, and . The response variable is assumed to be observed at equally spaced intervals that are indexed by . Including prior distributions for in the model specification leads to what is known as a full likelihood model (Congdon 2003). 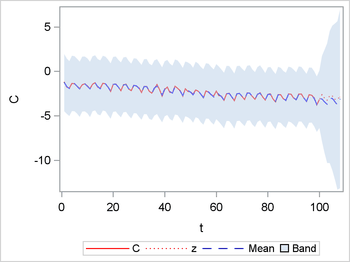 The following example fits an AR(4) model to a simulated time series with , and a sample size of 500. The statements that generate the data are not shown but are included in the sample SAS program file that accompanies this example. A copy of the response variable Y is generated and named X, and then the last 20 observations of Y are set to missing. PROC MCMC automatically imputes values for the missing observations, thus producing an out-of-sample forecast for the response variable. Keeping a copy of the original data stored in X provides the means to assess the accuracy of the out-of-sample forecast. Figure 1 shows the plot of the time series variable Y. In the PROC MCMC statement, the NMC= option specifies the number of MCMC iterations, excluding the burn-in iterations; the NTHREADS= option specifies the number of threads to use; and the PROPCOV= option specifies the method to use in constructing the initial covariance matrix for the Metropolis-Hastings algorithm. The QUANEW method finds numerically approximated covariance matrices at the optimum of the posterior density function with respect to all continuous parameters. The first PARMS statement declares the parameters , , , and and places them in a single parameter block. The second PARMS statement declares the parameter and places it in a separate parameter block. The third PARMS statement specifies that the unobserved initial conditions , , , and be treated as model parameters and places them in a separate parameter block. The first PRIOR statement specifies normal prior distributions with a mean equal to 0 and a variance equal to 1,000 for the parameters , , , and . The second PRIOR statement specifies an inverse gamma prior distribution with shape equal to 3/10 and a scale equal to 10/3 for the parameter . The third PRIOR statement specifies normal prior distributions with a mean equal to 0 and a variance equal to 1,000 for the initial condition parameters , , , and . The statement that follows is included strictly for convenience. It specifies , which is the mean of the response variable’s distribution. The quantities y.l1, y.l2, y.l3, and y.l4 represent the first, second, third, and fourth lag of the response variable, respectively. The MODEL statement specifies that the response variable has a normal distribution with mean and variance . The ICOND= option specifies the initial states of the lag variables for the response variable when the observation indices are out of the range. In the PREDDIST statement, the OUTPRED= option creates a data set, AR4outpred. that contains random samples from the posterior predictive distribution of the response variable. The STATISTICS=BRIEF option species that posterior means, standard deviations, and the equal-tail intervals be computed. By default, the number of simulated predicted values is the same as the number of simulations that are specified in the NMC= option in the PROC MCMC statement. However, you can specify a different number of simulations by specifying the NSIM= option in the PREDDIST statement. Because the last 20 observations of the response variable are set to missing, PROC MCMC treats those observations as random variables and imputes their values in the predictive distribution. The result is an out-of-sample forecast for the response variable. The ODS OUTPUT statement specifies that the information from the prediction summaries and intervals table be saved in the data set AR4PredSumInt. Output 1 displays the posterior summaries and intervals table for the model. The 95% HPD intervals for the parameters , , , , and all contain the true population values, and the means of their respective posterior distributions provide fairly accurate point estimates. Output 2 shows the effective sample sizes table. 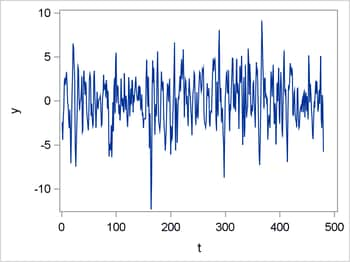 The autocorrelation times are high for all the parameters, and the effective sample sizes are small relative to the number of Monte Carlo samples. This evidence indicates slow mixing. However, the trace plots (not shown) provide no evidence that the Markov chain failed to converge. The following statements merge the original data set Ar4 with the ODS OUTPUT data set AR4PredSumInt and then use PROC SGPLOT to plot the original in-sample series, the in-sample prediction, the out-of-sample forecast, and a 95% HPD interval around the forecast. Only the last 100 observations are used in the plot to make it easier to visually assess the model fit and the accuracy of the forecast. Figure 2 shows the resulting plots. The solid red line represents the original in-sample response variable; the dotted red line represents the out-of-sample values of the response variable; the dashed blue line represents the mean of the predictive distribution; and the light blue shaded area represents the 95% HPD interval. As is typical of linear autoregressive models, the forecasts tend to lag at turning points, and the out-of-sample forecast accuracy diminishes as you forecast further into the future. Because the data are simulated with known population parameter values, model identification is not an issue. Thus, models such as this one provide a useful qualitative benchmark with which to compare the performance of models of "real world" data, where model identification is uncertain. The first equation states that the response variable is normally distributed and the mean of the distribution is indexed by time, implying that the response variable is nonstationary. The second equation states that the mean of the response variable consists of a trend plus seasonal effects. The third equation states that the trend follows a random walk plus drift. The fourth equation states that the drift term follows a first-order autoregressive process. The fifth equation states that the seasonal effect is a normally distributed random shock whose mean equals the negated sum of the three previous shocks. 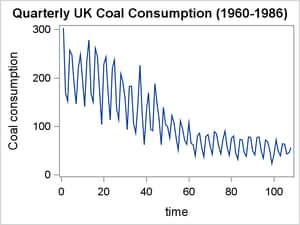 This example fits a time-varying coefficients model to observed quarterly coal consumption in the United Kingdom for the years 1960–1986. It is based on an example that is published in Congdon (2003, p. 207), which in turn is based on a model and data that are published in Harvey (1989). The following statements create the data set UKcoal, which contains the variables Coal, C, Year, Quarter, and T. The variable Coal measures quarterly coal consumption. C is a variance-stabilizing transformation of Coal; specifically, it is the natural logarithm of Coal divided by 1,000. The variables Year and Quarter represent the years and quarters of the observations. The variable T indexes the observations. Figure 3 displays the original coal consumption time series on the left and the transformed coal consumption time series on the right. It appears that the logarithmic transformation has successfully made the variance of the series more homogeneous. The following DATA step creates the variable Z, which is just a copy of C. After Z is created, Coal is set to missing for the years 1985–1986 to enable you to assess the accuracy of the model’s out-of-sample forecast. In the PROC MCMC statement, the NMC= option specifies the number of MCMC iterations, excluding the burn-in iterations; the PROPCOV= option specifies the method to use in constructing the initial covariance matrix for the Metropolis-Hastings algorithm. The QUANEW method finds numerically approximated covariance matrices at the optimum of the posterior density function with respect to all continuous parameters. The nine PARMS statements declare the model parameters. The three seasonal parameters , , and are placed in the same block; experimentation with this model and these data showed that putting all the other parameters in separate blocks improved the mixing. The first PRIOR statement specifies a normal prior distribution for the parameter , with mean equal to 0 and variance equal to . Experimentation with this model and these data showed that sampling the parameter on the logarithmic scale significantly improved mixing. The second PRIOR statement specifies a normal prior distribution for the parameter , with mean equal to 0 and variance equal to the parameter ; represents the initial state of the first-order autoregressive drift component. The third PRIOR statement specifies a normal prior distribution for the parameter , with mean equal to 0 and variance equal to 1,000; represents the initial state for . The fourth PRIOR statement specifies normal prior distributions for , , and , with means equal to 0 and variances equal to the parameter ; , , and represent the initial states for the seasonal random effect . The fifth PRIOR statement specifies inverse gamma distributions for the variance parameters , , , , and . All these distributions have shape and scale parameters specified to be 3/10 and 10/3, respectively. The first RANDOM statement specifies that the random effect has a normal prior distribution, with a mean equal to the product of and the first lag of and a variance equal to . Experimentation with this model and these data showed that sampling on the logarithmic scale significantly improved mixing. The SUBJECT= option specifies that the random effect is indexed by the variable T. The ICOND= option specifies that the initial state of is represented by the parameter . The second RANDOM statement specifies that the seasonal random effect has a normal prior distribution, with a mean equal to and a variance equal to . Experimentation with this model and these data showed that sampling on the logarithmic scale significantly improved mixing. The SUBJECT= option specifies that the random effect is indexed by the variable Quarter. The ICOND= option specifies that the initial states of are represented by the parameters , , and . The third RANDOM statement specifies that the trend random effect has a normal prior distribution, with a mean equal to and a variance equal to . Experimentation with this model and these data showed that sampling on the logarithmic scale significantly improved mixing. The SUBJECT= option specifies that the random effect is indexed by the variable T. The ICOND= option specifies that the initial state of is represented by the parameter . The next statement is included primarily for convenience. It specifies that , the mean of the response variable’s distribution, is equal to . The MODEL statement specifies that the response variable has a normal distribution, with a mean equal to and a variance equal to . Experimentation with this model and these data showed that sampling on the logarithmic scale significantly improved mixing. The PREDDIST statement specifies that the random samples from the predictive distribution be saved in the data set TVCoutpred. The STATISTICS=BRIEF option specifies that the posterior means, standard deviations, and equal-tail intervals be computed. The NSIM= option is omitted, so the number of iterations defaults to the number that is specified in the NMC= option in the PROC MCMC statement. The ODS OUTPUT statement specifies that the information from the prediction summaries and intervals table be saved in the data set TVCPredSumInt. Output 3 shows the posterior summaries and intervals table for the time-varying coefficients model, and Output 4 shows the effective sample sizes. The autocorrelation times are relatively large, indicating slow mixing. This is the reason that the number of MCMC iterations was set to the relatively large value of 100,000. Figure 4 shows the resulting plots. The solid red line represents the original in-sample response variable; the dotted red line represents the out-of-sample values of the response variable; the dashed blue line represents the mean of the predictive distribution; and the light blue shaded area represents the 95% HPD interval. The in-sample model prediction appears to fit the data. The out-of-sample forecast likewise appears to perform well. The 95% HPD interval around the out-of-sample forecast grows very quickly, indicating, not unexpectedly, that the further out of sample you forecast, the greater the uncertainty of the forecast. Congdon, P. (2003). Applied Bayesian Modeling. New York: John Wiley & Sons. Harvey, A. C. (1989). 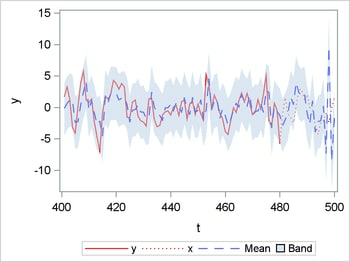 Forecasting, Structural Time Series Models, and the Kalman Filter. Cambridge: Cambridge University Press.